Dear customer there are no plans to update the RocketRAID driver to support FreeBSD 9.0. Note: Our RocketRAID 27xx series controllers have native support in FreeBSD 9.0. I will never purchase any product from this HighPoint. 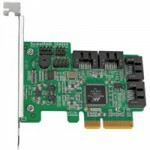 What it differentiates with other similar cards is the number of PCI-express channel. It comes with 4 channels while the other cards only carry one. In the other words, it will make transfer speed higher. Anyway, long story short. FreeBSD does not recognize this card by default. You need to install a driver to support it. Unfortunately, the driver is version specific, and the driver on the web only supports up to FreeBSD 7. I have two choices – Switch to the legacy Microsoft Windows / Linux, or downgrade to FreeBSD 7.0. One way or the other, I need to say Goodbye to ZFS.